I started to pay more attention to my haircare products ever since my hair started going through chemical treatments such as bleaching and most commonly hair dyeing. It's quite disheartening to see my hair quality deteriorating every time after I visit the salon. 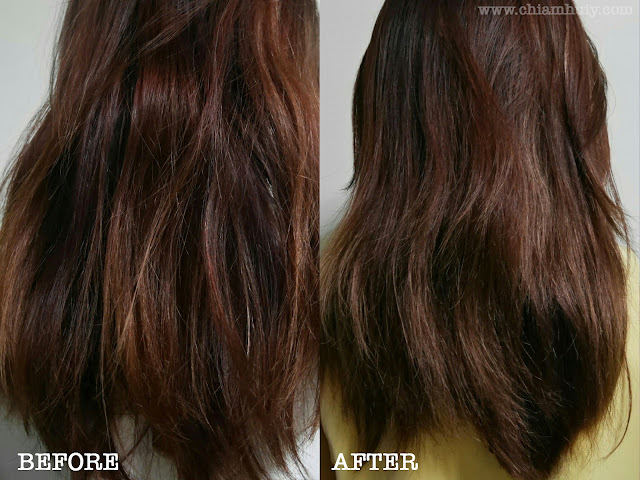 No doubt, you can do hair treatments to salvage the damage, but such treatments are usually short-lived and it can only lasts probably a week or so. 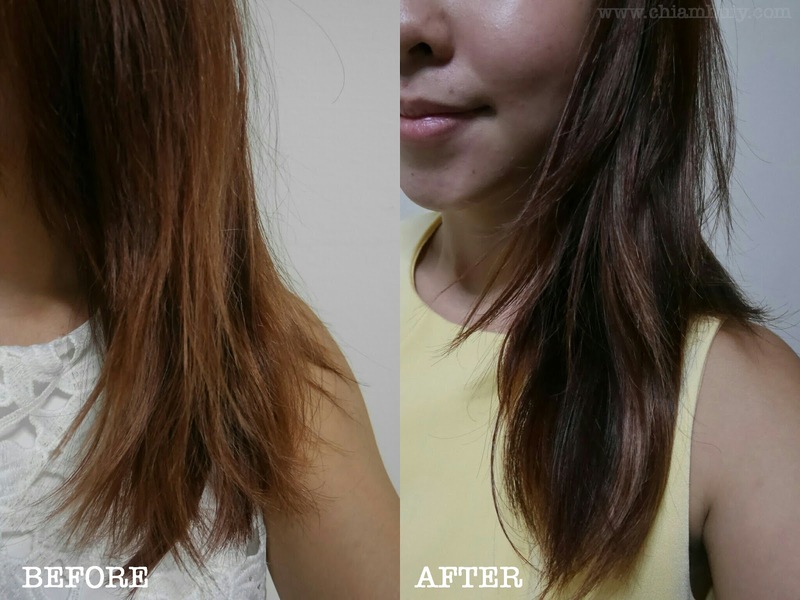 So this results me to be always in the search for a good hair care range that can revive my damaged hair. 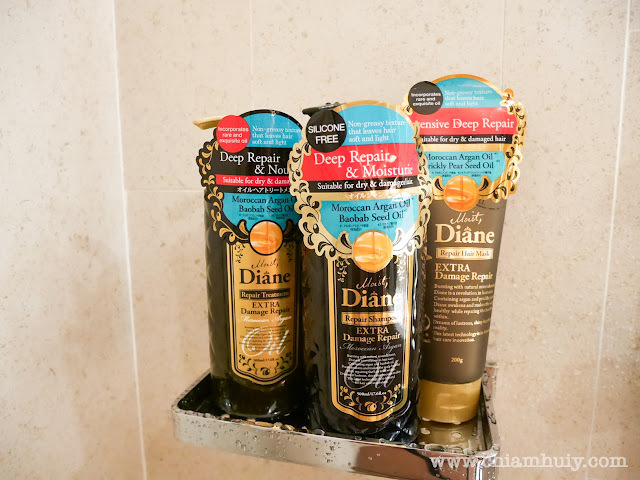 I knew I needed something that can take care of my hair daily as I wash my hair, such as a damage repair hair care range like Moist Diane Extra Damage Repair Haircare range. I picked the Extra Damage Repair series because as the name suggests, I clearly need an extra damage repair to my hair! 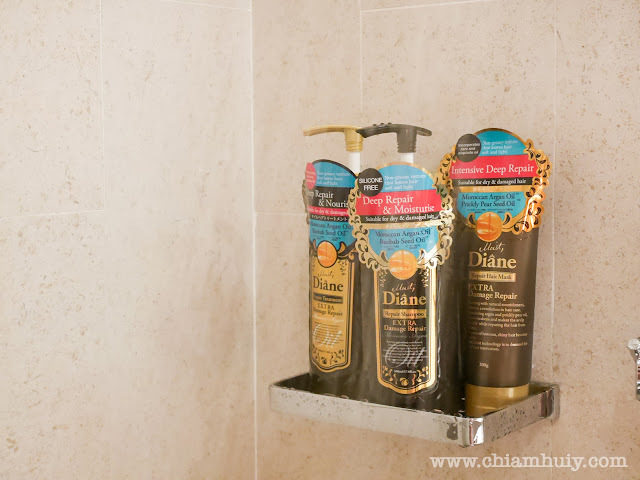 The three products in this range are: Moist Shampoo, Moist Treatment and Repair Hair Mask. This haircare range are infused with several beneficial ingredients to both the hair scalp and hair ends. First, it's packed with rare plant oils sourced from all over the world which deep-cleanses the scalp and hair gently and thoroughly, yet do not strip off the natural oils. Not just that, Moist Diane also has Baobab Oil packed in it. Rich in vitamins A, D, E and F, and omega 3, 6, and 9, it is especially beneficial for hair and scalp. It comes from the Baobab tree, the Tree of Life because it can live up to 6,000 years. 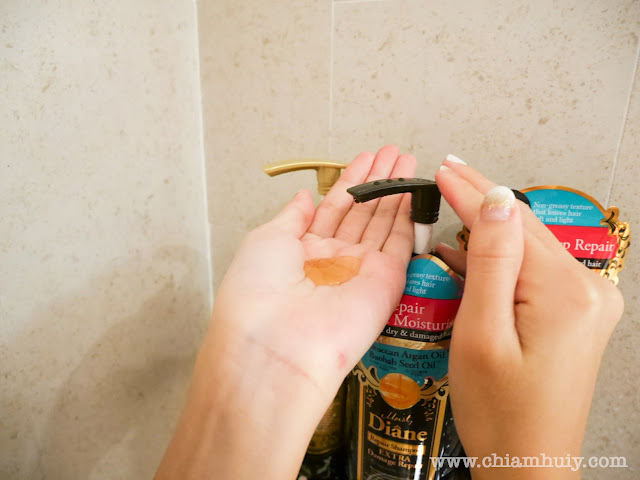 We also all know about the wonders of Moroccan Argan Oil. Such oil are commonly known as 'liquid gold' because it is packed with Vitamin E, antioxidants and fatty acids to protect and hydrate the scalp. While deep cleansing the follicles, it also provides vital nourishment to keep your hair smooth, soft and airy. Another great point about Moist Diane Extra Damage Repair Haircare Range is that it is Silicone-Free! 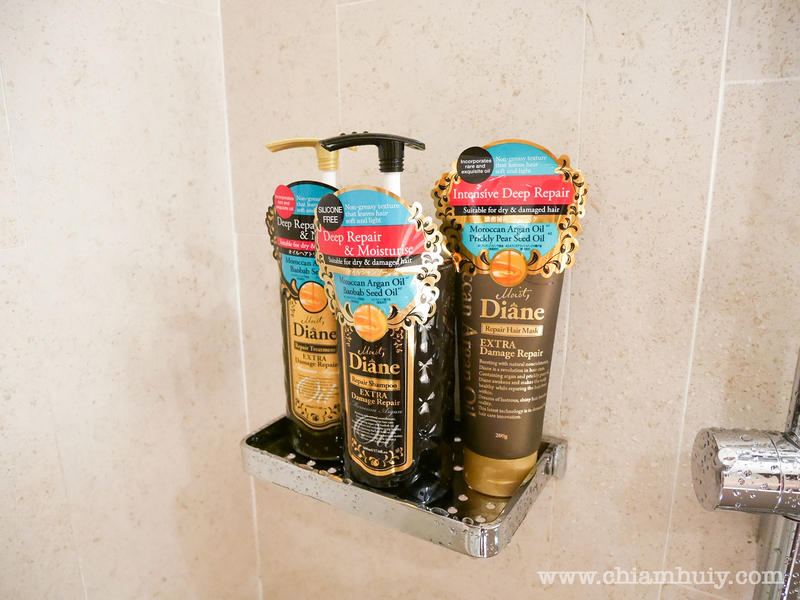 We all know silicones are commonly found in commercial shampoos to give an artificial hair shine. Such ingredient is in fact unhealthy and damaging to the scalp, as they may build up and clog the hair follicles, leading to hair fall. 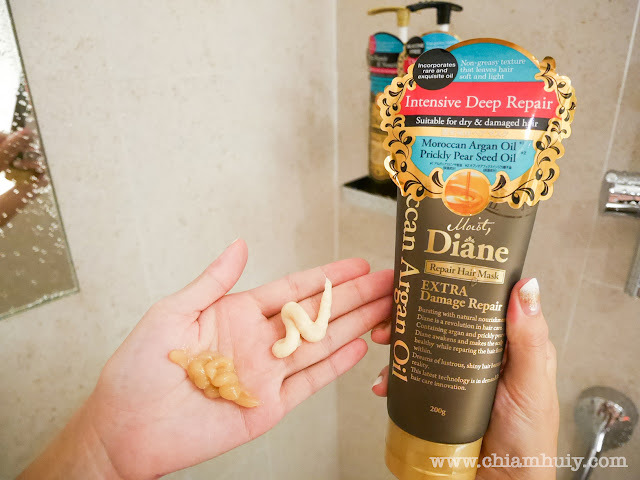 Another interesting fact that I got to know while I read up more on Moist Diane Extra Damage Repair Haircare Range is that a single oil ingredient is often not enough to protect damaged hair. A well-balanced blend of oils is more crucial to tackle different issues and externalities. 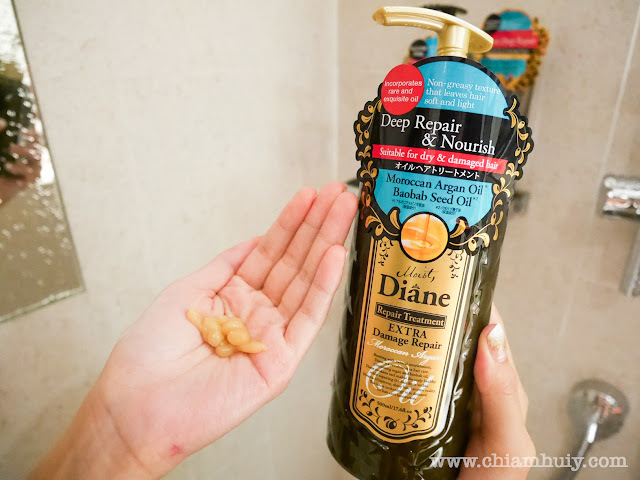 Moist Diane Extra Damage Repair is in fact packed with Moroccan Argan oil and 9 other types of handpicked botanical oils. This range is also suitable for coloured hair too! Coloured hair is usually dry and frizzy due to exposure to chemical treatments, so you need a good haircare range to take care of your hair. Available at Watsons, NTUC Fairprice, BHG, John Little and Meidi-ya. 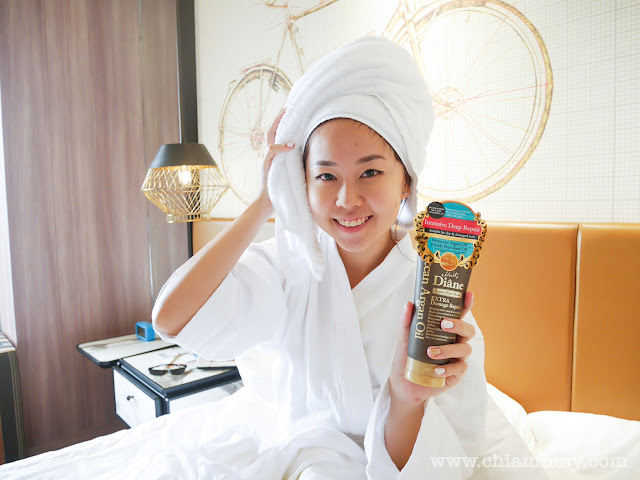 Do you want a weekly maintenance hair care product? 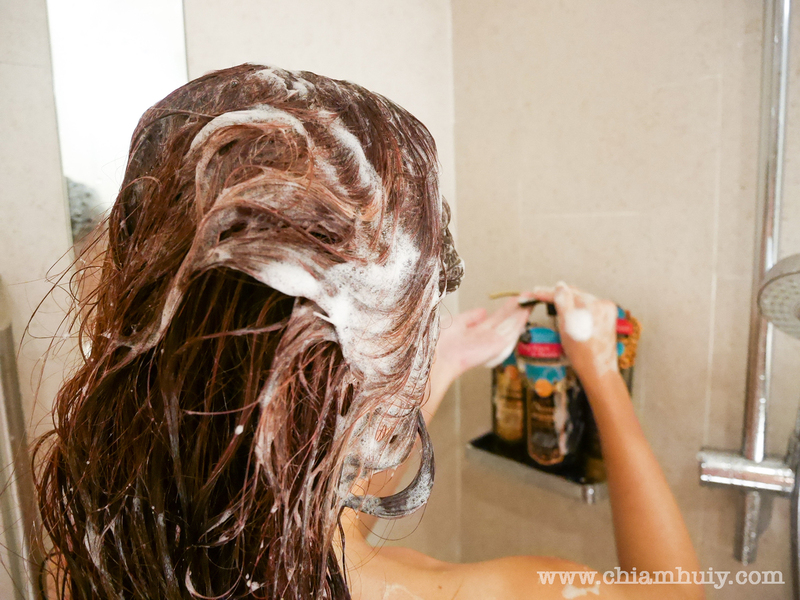 Try the hair mask from this range to give your hair that weekly pamper session. 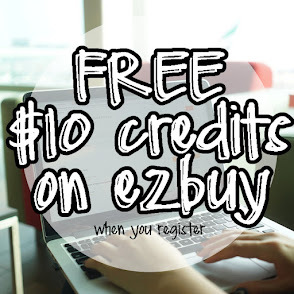 You can use this once or twice a week. Simply use this after you shower and shampoo your hair, with towel-dried hair. You can either leave it on like this, or you can wrap your hair to give that extra heat to increase better absorption of the hair mask ingredients. 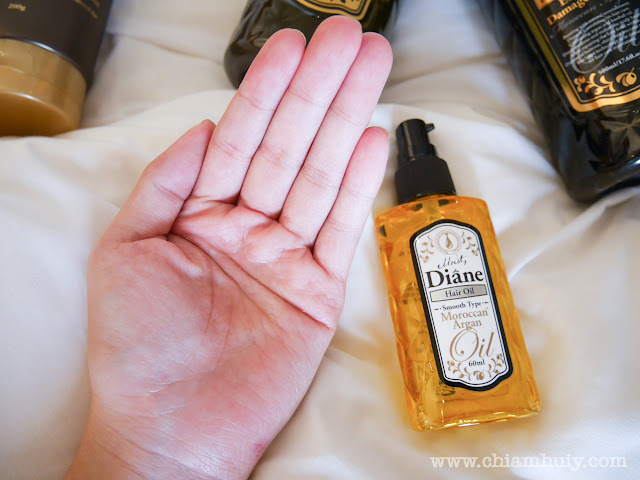 Moist Diane Smooth Hair Oil is pretty light weight and it smells terrific. Again, it has high concentration of Moroccan Argan Oil to deeply moisturise and repair hair ends, giving your hair the shine it has lost. I also like that it comes in a petite bottle which makes it easier to bring it around. It's a pump bottle as well so you don't have to worry about any mess possible. I started using the Moist Diane Extra Damage Repair Haircare Range and I am quite impressed. As you can tell, my hair is reallllyyyyy damaged cause the last few inches have gone through bleaching twice. I also dye my hair pretty often! After a few usage of the hair care range, I find my hair really bouncier and softer in general. It smells good too! I like that my hair isn't too frizzy as before. 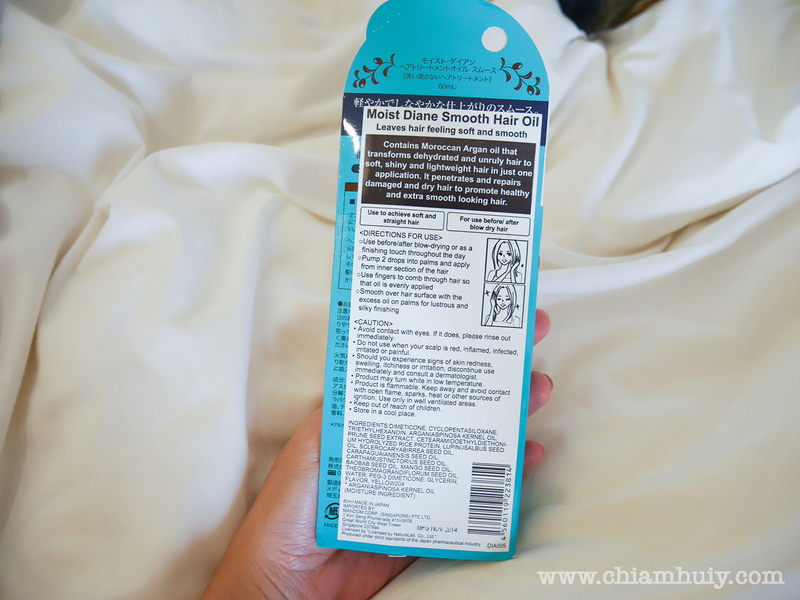 Even if result aren't that immediate, I can first apply the Smooth Hair Oil to keep them moisturised throughout the day. 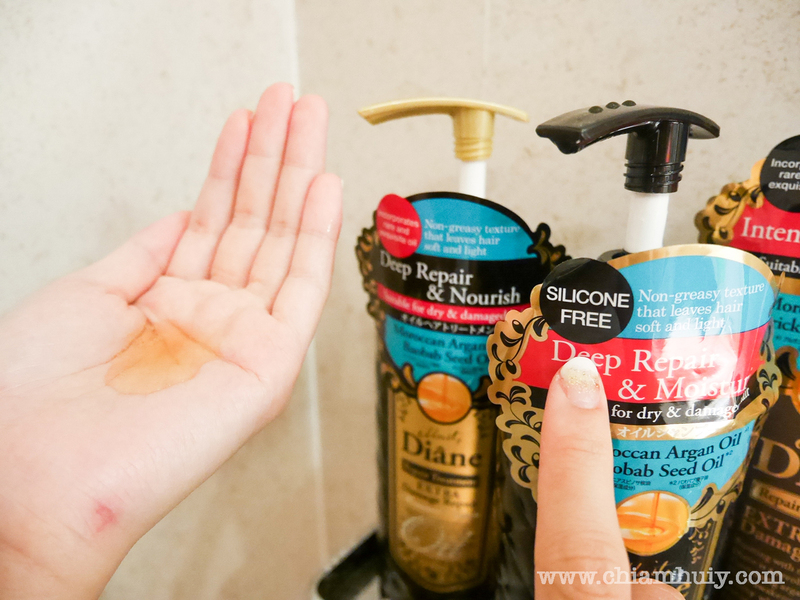 I guess Moist Diane Moroccan Argan Oil and non-silicone formulations are wayyyy healthier for my scalp and hair! Moist Diane Extra Damage Repair Haircare Range is available at Watsons, NTUC Fairprice, BHG, John Little and Meidi-ya. To understand more about Moist Diane, visit https://www.facebook.com/moistdianesg/.